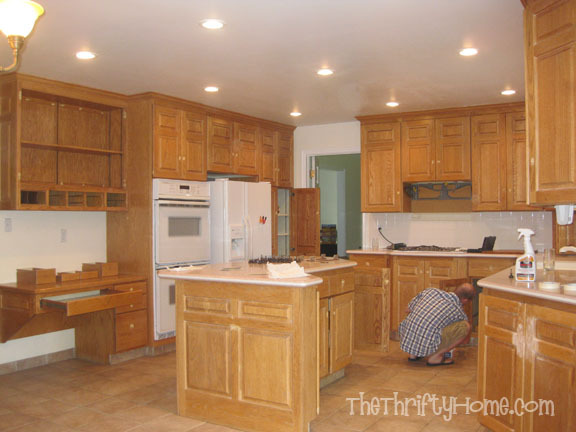 Last summer, we decided to paint our kitchen cabinets which led to painting and re-building our entertainment center, painting our built-in bookcases and mantel, ripping out the tile and installing a laminate floor, and all sorts of other projects. I put off writing this post, because this was a very involved project that led to many other projects and I just haven't had time to write up everything. We bought our 1984 house 18 months ago and it had a TON of honey oak cabinets everywhere. After about 6 months I couldn't take it anymore and decided to paint all the honey oak in the kitchen-greatroom. Hover your mouse over this photo to see what it looks like now. 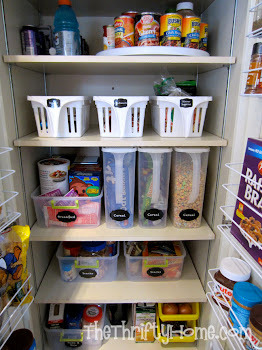 One of my cabinets was built for a garbage can and has a fancy pull out bottom, but I like having my recycling bin and garbage out for easy access. Hover your mouse over the photo below. I kept the doors off the cabinet above the desk to give it a more open feel. I keep my cookbooks here and like to have quick and easy access. I used paint stripper, sanded the top of the desk and bought the darkest stain I could find. I applied several coats of stain to get it nice and dark and then I applied several coats of polyurethane. This is what I originally planned for this desk, but I soon decided that I didn't like the computer in the kitchen and would rather have a bulletin board and bright red retro phone. I bought this phone at Amazon for free with my Swag Bucks and I LOVE it! The cordless phones in my house seem to disappear and I can never find one when I need it. No one can walk away with this phone and I no longer miss calls. I installed a talking caller id (also from Amazon) under the cabinet which is the round looking thing. I LOVE having my calendar, phone, phone numbers, and other important papers right here in the heart of the home. 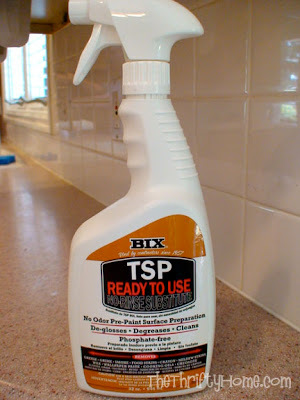 Instead of sanding, I cleaned all the cabinets with TSP. We also did the entertainment center, mantel, and built-in bookcases at the same time and there is no way I was going to sand all of that oak! Painting all of the cabinets with a brush would have taken forever, so we bought this Wagner Control Spray for around $50. We had to thin out the paint with water, but we did several coats and it gave us a beautiful and smooth finish. 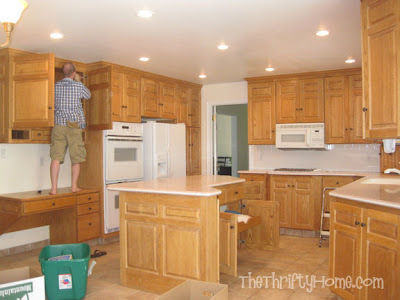 I didn't like the placement of the knobs, so we filled in all the holes (My husband and I are both short and the knobs on the taller upper cabinets were way too high for us). 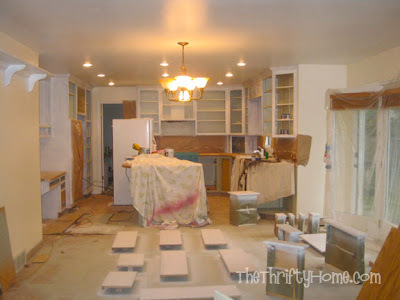 We took off all the doors and taped up the countertops. I bought lots of paint samples and experimented before deciding on the right colors. Since there are a LOT of cabinets (one of the reasons I fell in love with this house) I thought I should break up the monotony and do the bottom cabinets a different color. We used Bulls Eye 1-2-3 Primer and had it tinted for the bottom cabinets. The primer claims to work on glossy surfaces with no sanding necessary and it did. 1. 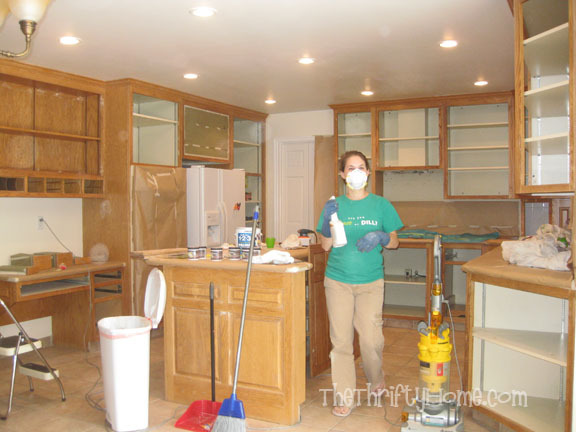 TSP to clean the cabinets and prep for painting. 2. Bulls Eye 1-2-3 Primer (had some tinted to match the bottom cabinets). 3. Behr flat paint matched to Martha Stewart Mourning Dove for the bottom cabinets. We sprayed 3 coats and used flat paint since we painted polyurethane on top. 4. Behr flat paint matched to Sherwin-Williams Alabaster for the top cabinets. We sprayed 3 coats. 5. MinWax water based oil-modified polyurethane clear semi-gloss. We tried to spray this, but it ran and looked terrible. We brushed 3 coats of this on all the cabinets creating a nice hard finish. This did darken the paint making the alabaster white a much darker cream, which I was planning on when I chose alabaster. 6. 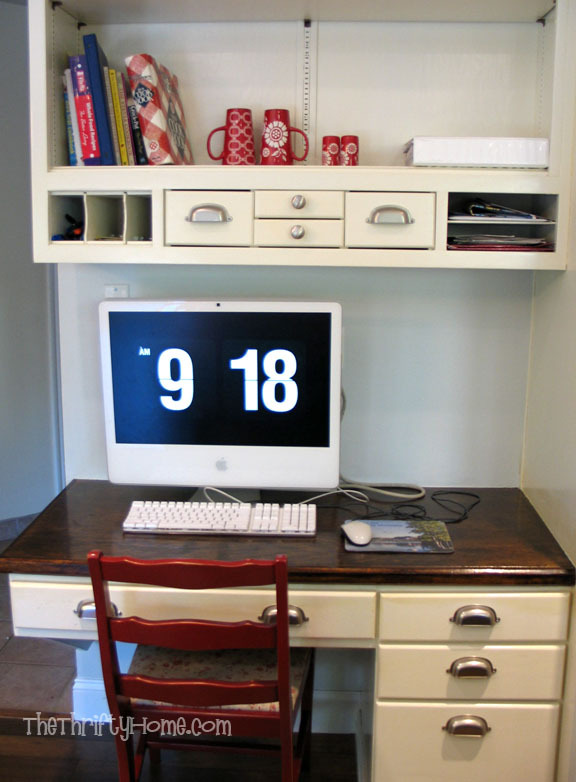 A contractors pack of stainless steel knobs and some Martha Stewart pulls for the drawers. It has now been a year since we painted these cabinets and they are still beautiful and durable. Painting all those coats of polyurethane has really paid off and makes cleaning the cabinets easy. 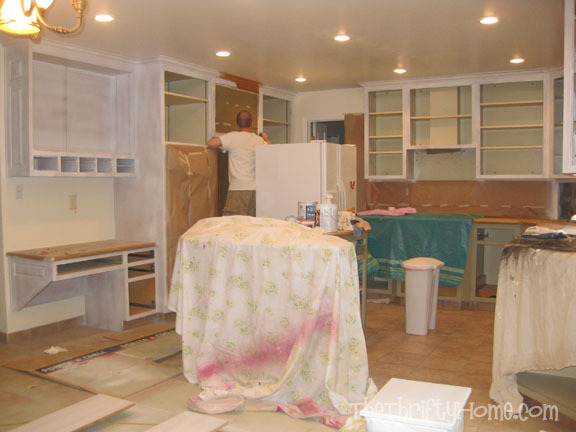 We are getting ready to paint our cabinets soon. I am so tired of oak. :( We may do 2 tone also. Love the look! Can you tell me talking caller ID you bought? I think I need one! It didn't get very good reviews, but I like it because I have Ooma and can customize the way it announces callers. So, here's the question of the day. Now that all the work is over, would you do it all over again? 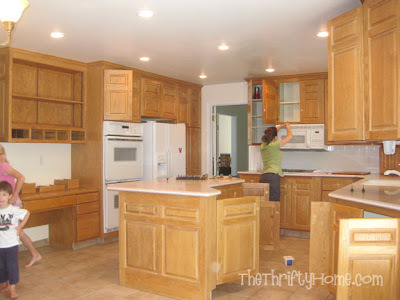 We have the same honey oak cabinets in our kitchen and they are showing a lot of wear. I've considered painting them, but remembering all the work my mom went through to paint ours cures me of that idea. Also, it wasn't long before the new paint starting peeling and chipping off. My mom sanded and primed all the cabinets, but they just didn't wear well. Maybe the polyurethane is the trick, and it's good to hear that after a year your cabinets still look nice. Hmm - I might just have to add another project to my long list. Your kitchen looks SO great. You guys are super talented. We did our oak cabinets at our last house the same way and they held up for 10 years; The polyurethane is the key. I would do it again and have been very happy. Ours was a lot more work because we have a big kitchen and also did the built-ins and entertainment center not shown in this post. We probably did the equivalent of 4 kitchens with this project. There is one small spot that is starting to wear though. The tip tray directly under the sink is having problems from all of the constant water that it gets. I just need to add several more coats of poly and it will be fine. that is the best thing i've seen all morning. it is absolutely amazing. 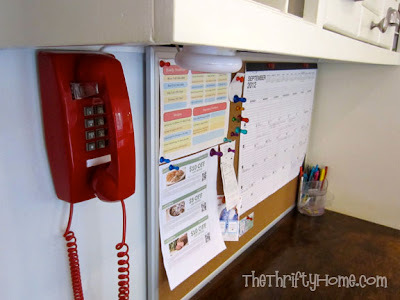 i looooove the two tone cabinets and the pops of red. you rocked this!! You did a wonderful job and Thanks for posting how you did it. 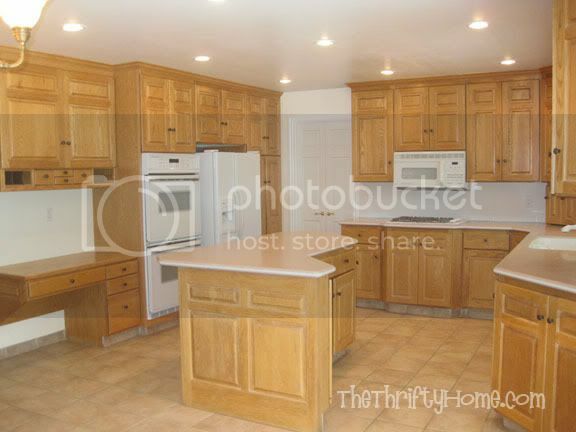 We are going to do the same thing to our kitchen next year. Big job with knotty pine, but this will help us. Congratulations! 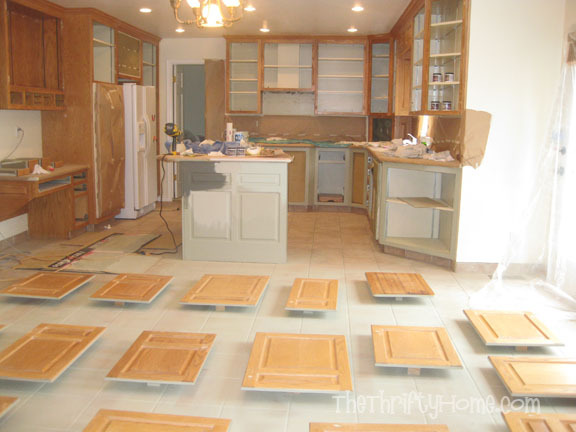 You've been featured on Handy Man, Crafty Woman's Wicked Awesome Wednesday! Please feel free to stop by the website to pick up your button! Thanks so much for sharing! This transformation is amazing! So much brighter and uplifting! Coming over from Inspiration Friday! Christie at Three Pixie Lane P.S. How do you do that really cool 'mouse over' thing? I love that! wow what an amazing transformation!!!! You did indeed do a wonderful job. It's looks very beautiful. We are in the middle of rebuilding our kitchen - it has stalled due to poor health for both of us. I presently have 1/2 m or about 2 ft of bench space which is depressing for me. I'm a bit jealous of all your cupboards & benches. Definitely a reason to buy a house. Thank you for sharing. 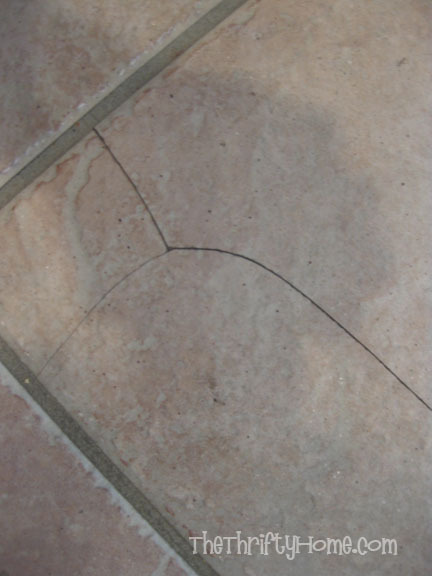 I never can figure out what to do with our tiles, I will take a look at what you did. Our house is late 80's as well. 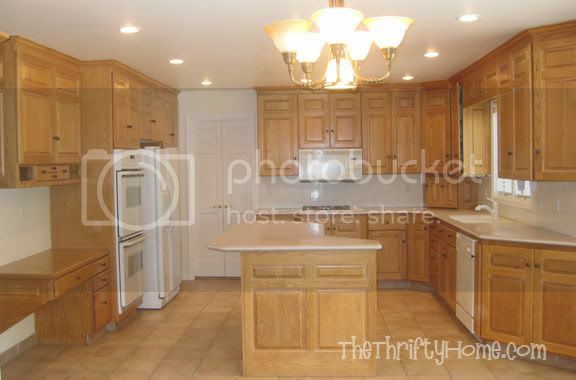 Thank you for sharing, my kitchen is a mimmic of yours (much smaller) but w/ white appliances and honey oak cabinets. I really want to try this, I even have my husband on board, and he is one that DOES NOT WANT TO PAINT WOOD. Thank you, Thank you, Thank you!!! I really hope you still look at these comments. I am up to the Minwax, water-based, Polycrylic, clear semi-glass stage and I am petrified to start this. What kind of brush did you use? Did you have to sand in between coats? I have been reading posts regarding this and everything says you have to sand bubbles and stuff away and you said nothing about any sanding in this stage. I DON'T want to have to sand. PLEASE help me. Sorry for the late reply, I somehow missed this comment. I hope it worked out for you. I was too lazy to sand in-between, and it still worked out, so I'm sure whatever you did looks great. I would love to see pictures. 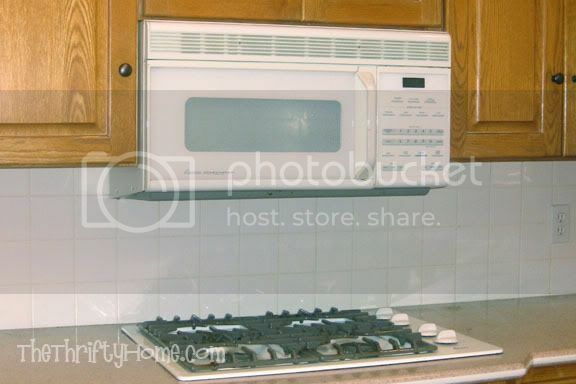 I love your kitchen and would like to try it. What color did you paint the walls? Looks like a pale blue or gray? The floors are beautiful. I don't even remember the color name, but it is a gray with a small tint of blue. Hi! I am getting ready to paint my oak cabinets, and after looking at what seems like millions of before and after pictures I am a little put off by being able to see the woodgrain in other peoples pictures. 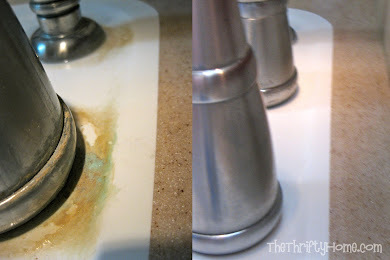 Is it noticable on your cabinets? Does spraying them make the difference? 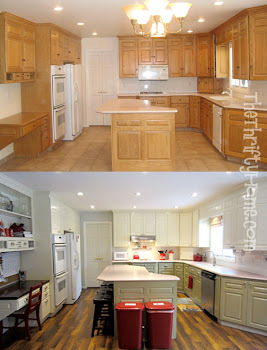 I love your kitchen, such an incredible makeover! Personally, I love the wood grain. 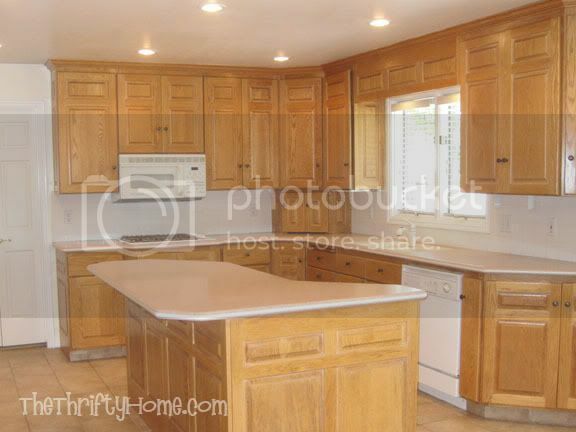 It shows that you have quality solid wood cabinets, instead of cheap manufactured wood with veneer. However, it is not very noticeable on mine, unless you look really close. I have furniture that I have brushed and you can see the brush marks. Spraying makes it very smooth and even. The more coats you put on, the less you will see the wood grain. Good luck, it is a lot of work, but so worth it. 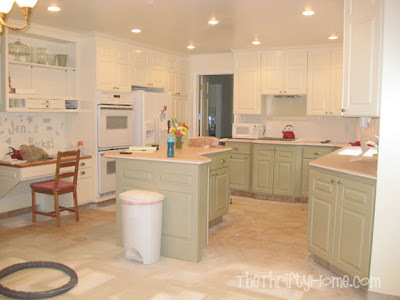 I would love to see your kitchen when it is done and hope you link it up to my Penny Pinching Party and leave me a comment. Did you paint the inside of your cabinets too? 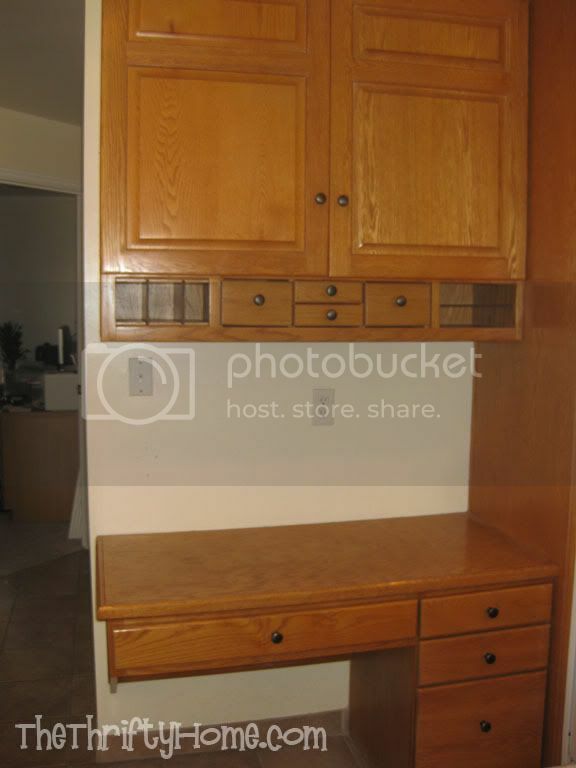 I want to paint my cabinets but the inside are not wood, but rather a cheap pressed laminate. I'm wondering if the 123 primer will work on the insides or if they will end up chipping? Do you have any thoughts? Thanks for the post! The inside of my cabins is cream laminate and I left it alone. I know there are people who paint laminate and there is a special paint for it, but I have never tried. Did you not have a lot of over spray using the sprayer? Yes! We taped everything up we didn't want sprayed and made a pretty big mess. Totally worth it though. Looks great. I have read that using polyacrylic over white paint will cause yellowing because it does not contain UV blockers. Have you noticed any yellowing? It does cause some yellowing. I chose a paint color that was a little lighter than I wanted and planned on it darkening a little. 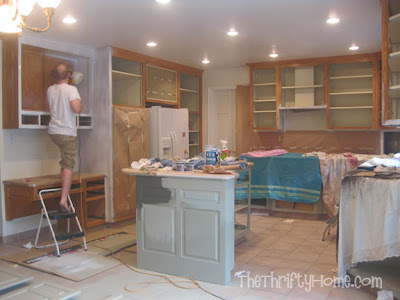 As we speak, my husband and I are painting our kitchen cabinets. We are wondering how long you waited before applying the first layer of poly and then how long you waited in between each layer of poly. Thanks! I followed the directions on the paint can. We painted during warm weather, so it didn't take very long. Hi there. Thank you so much for this post. After reading you post I tried on a sample cabinet to see how it comes out. 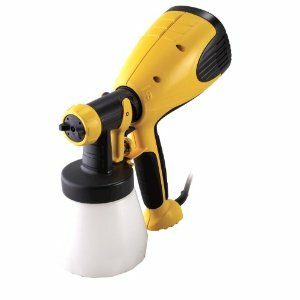 The spray gun you recommended caused the paint to splatter and drip everywhere. I reread and saw that I didn't add any water to the paint. Can you provide some insight our guidance around how much water you added to the paint to thin? Your sprayer should have come with a tester that shows you when you have the right mixture of water. Every sprayer is different and even the paint is different. We just kept adding water until the paint ran through the tester. WOW! What an incredible job. You are indeed very handy and have great taste. I'm gathering the strength to do my house as well since I have a handy husband and I'd like to think I have the good taste! :) Thank you for inspiring me and for making me realize it is possible to do the changes I want without breaking the bank! That was amazing! I have repainted my kitchen cabinets before…yours look better, but instead of paint sprayer I used paint brush. Thanks for the advice. Picked out out colors for our 1984 kitchen "paint over". I'm doing the walls, cabinets, AND counters. (Faux marbel). Can you tell me where you bought the Bix cleasner?